The La Harpe Senior Citizens Club was organized in 1970 to provide a social place for seniors in the La Harpe area. They meet at their center located at the SW corner of 1st Avenue and South A Street which situated across from the southwest corner of the City Park. Presently, there are around 50 members which a low membership fee of only $5 for anyone 55 or older. Meals are served at the center for lunch each Monday through Friday which are contracted through the La Harpe Davier Nursing Home at a low cost. Seniors need to call the Center around noon the day before at (217) 659-7764 or call Lillian Crabill at (217) 650-3380 by 10:00 a.m. on the day you wish to eat. The meal time each day is a good time for fellowship, especially for those who are not involved with community activities. Meals may be delivered to your home if you are not able to come to the Center. Bingo is played the last Friday of each month. A monthly potluck and meeting is at the Center every 3rd Saturday. (In June it will be on the 4th Saturday, June 28th). There is card playing on Tuesday and Thursday and any other time a group can gather. Please come and join in. The Center is listed as a non-profit organization and is supported by memberships and donations. The city owns the house and grounds, but the seniors are responsible for utilities and upkeep inside the building. Any appliances, carpet, etc. is replaced by donations. Groups, organizations, family gatherings, etc. may use the Center for a donation. 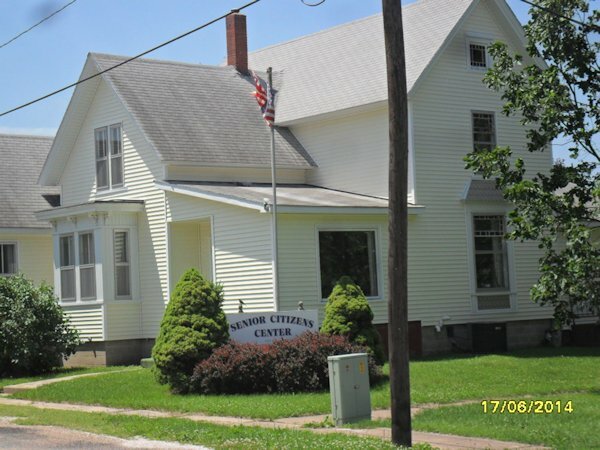 The city received a grant in 2000 which was used to replace the furnace and air conditioning and to repair the foundation. Periodically, the Center sends out cards advertising a bakeless bake sale. Instead of furnishing something for a bake sale, the person is asked to make a donation of money. This and the annual fall fund drive has been a big help to keep the Senior Center open. President, Clyde Collins; Vice President, Margie Walker, Secretary, Louise Collins, and Treasurer, Ada Hubbard.